When MP3s conquered music, it depended on three key technologies: CD ripping software, file-sharing software, and MP3 playing software, primarily Winamp. 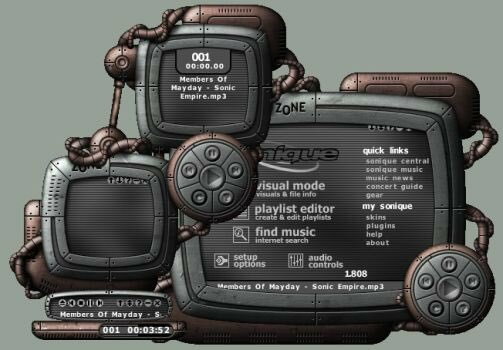 Winamp was infinitely customizable, and there was an exuberant practice of coming up with MP3 player skins (some of Winamp's competitors adopted its skin format, making the skins interoperable among different players), and sites devoted to featuring and distributing the coolest skins. This is long gone -- the sites, the files, all of it, except for the fraction preserved by the Internet Archive. But Google Images still preserves fragmentary relics of this lost art, and John Hendren has rounded up a selection of "unusable and incomprehensible skins" from the glory days.